Welcome to the Foxes Choral Department! Foxes Music's dedicated Choral staff is here to provide you with the best service and selection of sacred and secular music in the area! We have over 50,000 choral music items in our browsing library divided by voicing and special categories like Movies & Musicals, Patriotic, Spirituals, Advent/Christmas, Lent/Easter, and New Issues. Our organ and handbell music is organized in a similar fashion. We also have a large choral masterworks section, many collections, some hymnals, and we stock choral folders. If you have any questions regarding our wonderful selection of choral music, please call us at 703.533.7393 extensions 313 and 314 or email us HERE If we don't have what you're looking for, we'll be glad to order items for you. Orders usually take 10-14 days and if you pick your order up, there's no S&H. We can obtain music more quickly with additional S&H charge. We ship music orders to our customers all over the country. For our customers with choral accounts the regular discount on choral music is 20% except for import items or items from smaller publishers. Don't miss our annual choral music sale during June when you may obtain up to 30% discount on items depending on the quantity ordered with restrictions on foreign and smaller publishers. We will be happy to establish an account for your organization. If you already have an order in mind you may call us, leave us a voice message, or email us HERE If you would like to send your order using an order form, our choral order form is available for download in our RESOURCES section. Once the order form is printed and completed it may be scanned and emailed, FAXed, or sent via USPS. We are happy to announce that we now have perusal copies of all Mårten Jansson selections available through Bärenreiter in our browsing library. For more information about Mårten Jansson click HERE. To see the works available, click HERE. Continue for virtual reading sessions, catalogs, and more from a few of our many publishers. We are pleased to help you request your show license for your next middle school musical production from Music Theatre International, R&H Theatricals, and Teatrical Right Worldwide! Check out NEW Lent/Easter Portal! If you miss Hal Leonard's discontinued CDs in the mail program, you'll be interested in what they have available online. Click HERE to see all current Hal Leonard promotions. Click HERE for 2019 Choral Spectrum High School Edition. Click HERE to see Alfred's current Catalogs & Promotions. Click HERE to view current Lorenz catalogs. Women's History Month 2019 will take place in March. Celebrate the myriad of choral music from top-notch female composers and arrangers available now from Hal Leonard. Add the titles listed below and more to your spring choral concert selections! We were the first in the 18th century, and we want to be the first for you in the future as well. “first in music” – that was and is Breitkopf & Härtel. Since 1719! 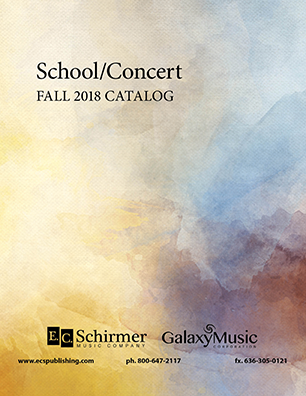 Click HERE for new Fall 2018 Anthems for children's choirs. Click HERE for new Fall 2018 Anthems for SATB choirs. 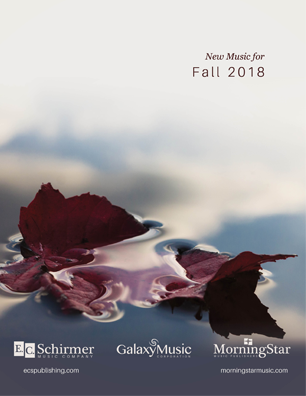 Click HERE to view Augsburg New Choral Releases for Fall, Advent, & Christmas 2018. This month, explore our new Choral Highlights 2018 recordings, discover new music by Bob Chilcott and David Bednall, and browse a selection of music commemorating the centenary of World War I.
Hal Leonard has the choral music that will help developing voices sound great and improve their skills while singing music that they love. These selections are part of the DISCOVERY SERIES, which features music for choirs in upper elementary and middle school, and pays special attention to range, tessitura, voice-leading and text to assure success. VoiceTrax CDs are available for Discovery chorals. This includes a full performance of the primary voicing, accompaniment only and part-predominant tracks for each voice part on each voicing. Browse through some of our newest selections in the Discovery series using the links provided below. Oxford University Pressis is delighted to welcome David Bednall and Sarah Quartel as Oxford composers, both already known to many. In celebration of International Women’s Day this month, they’re featuring new music by Cecilia McDowall and Elaine Hagenberg. Also discover Stabat Mater, a new work by Gabriel Jackson, and explore two recent additions to Oxford's popular Emerging Voices series. Press HERE to see this Choral News. Some of today's hottest music is brought to the forefront from blockbuster hit movies. Today's school choirs will love to sing music from The Greatest Showman, Coco, and Pitch Perfect 3. Click on any of the titles below for more details. Want to see even more Hal Leonard choral music from the movies? Click here to go to our website.